Hillary Clinton, former Secretary of State and rumored celestial body, has not driven a car since the mid 1990s. The dowager countess, at least, would approve. 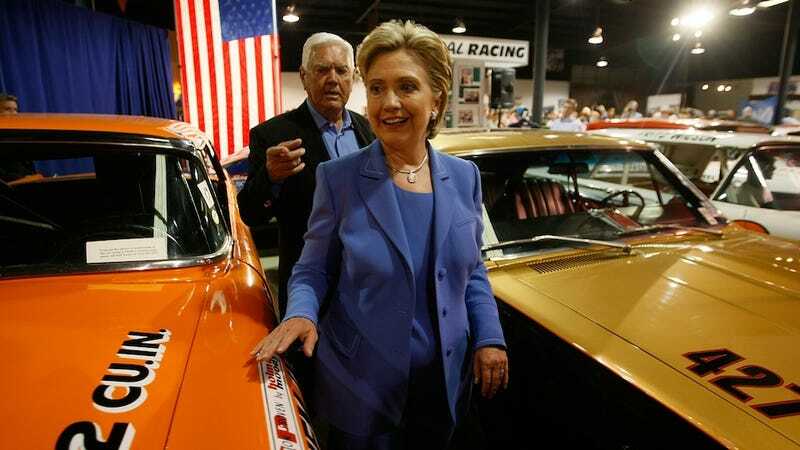 "I have to confess: One of the regrets I have about public life is that I can't drive anymore," Clinton said, before joking: "My husband thinks that's a blessing, but he's the one who should talk." She told a meeting of the National Automobile Dealers Association that she hasn't been behind the wheel since 1996, wisecracking that, "I remember it very well. Unfortunately, so does the Secret Service, which is why I haven't driven since then." Her first car was a 1963 Oldsmobile Cutlass, according to Detroit News, and she and Bill once owned an El Camino—with astroturf in the back. It's pretty standard for presidents, first ladies and other high political muckety-mucks to give up their wheels. Bill Clinton is limited to a golf cart; when George W. got caught driving around his ranch without a seatbelt, it became a news story. It's not totally the rule, though: Queen Elizabeth drove a truck in World War II and still cruises her extensive holdings in her Range Rover. If you tried to take her keys she'd probably sic the corgis on you.